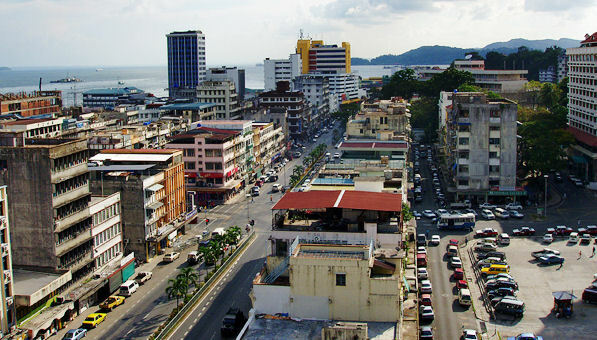 Sandakan is a town on the east coast of Sabah, facing the Sulu sea. It is a town rich in historical sites and a gateway to many eco-tourism destinations. To the west of Sandakan (about 20 min drive) lies Sepilok Orang Utan Rehabilitation centre. It is the world oldest and largest Orang Utan Rehabilitation centre. 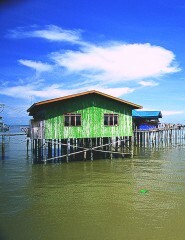 "Sandakan" is derived from the Suluk word "sanda" meaning, to pawn and "kan" being the suffix. So "Sandakan" means the place that was pawned. William Clarke Cowie, in the early 1870s, a Scottish adventure and engineer, delivered guns and ammunitions to the Sultan of Sulu. He did this for protecting territory of the Sultan against the Spanish conquerors. In return, Cowie was granted permission by the Sultan to set up base on Pulau Timbang, in Sandakan Bay, where a small Suluk village existed. 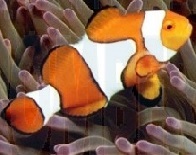 Cowie called his base "Sandakan". In 1883, the British North Borneo Chartered Company moved its capital from Kudat to Sandakan. 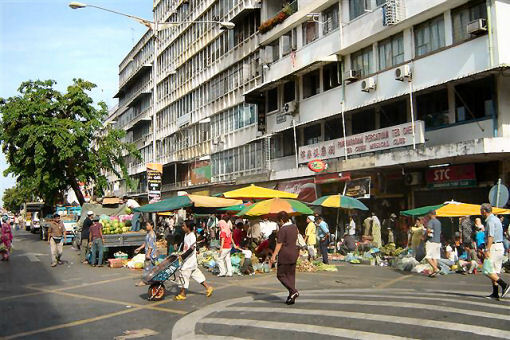 A "building mania" started and Sandakan became a bustling modern town. Allied bombings towards the end of World War II nearly flattened the town.In 1946, the capital was moved to Jesselton. In 1968 they changed the name to Kota Kinabalu. There are daily flights from KLIA (KUL) or Kota Kinabalu (BKI) to Sandakan airport (SDK) by both Malaysia Airlines (MH) and Air Asia (AK). At Sandakan airport, there are two main options to get to Sepilok. The easiest one is by taxi. Otherwise, there are a number of public buses that go into the orang utan sanctuary. Journey will take about 20 minutes. Sam Sing Kung Temple, or the Three Saints Temple. Located at the edge of the town padang (town field). Dating from 1887, the Three Saint's Temple is the oldest building in Sandakan. - and the Emperor Min Cheong, worshipped by those who seek success in examinations. Before school exams you will find hopeful students at this temple, which was built by four Chinese communities: the Hakka, Cantonese, Hainanese and Teochew. Places of interest in Sandakan include the Puu Gih Jih Chinese Temple - a majestic temple erected on top of a hill facing Sandakan Bay. 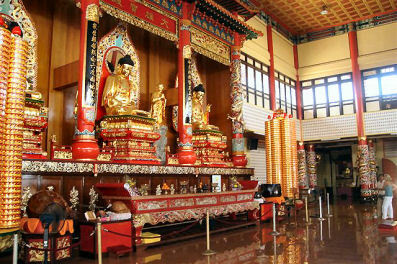 Don't miss the panoramic views across the town and huge bay from the great Puu Jih Shih Buddhist temple. St Michael and All Angels Cathedral, erected in late 19th century and one of the oldest stone buildings in Sabah. There's also an interesting forestry exhibition and orchid house to visit. Other places of interest that can be visited are the world famous Sepilok Orang Utan Sanctuary which is located just 26 km from Sandakan. The Sandakan Crocodile Farm located on the Labuk Road near the Sepilok Orang Utan Sanctuary is also a major attraction. Sabah Hotel is a haven for nature lovers as this eco-friendly resort is situated in the center of a tropical rainforest. Perched on top of a hill, guests will enjoy the view of the natural surroundings and plant life. Complimentary newspapers, work desks, mini bars, and satellite television are a few of the amenities included in the guestrooms. Start the day with a Western or Asian breakfast from the Plantation Caf�, but be sure to save enough room for a Chinese lunch at the Ming Restaurant. Corporate travelers may utilize the Executive Parlor which is fully equipped with meeting rooms, cocktails, and food menus. The pool, tennis courts, nature walks, and game facilities are available for a little recreation. Be sure to take the kids to the Sabah Hotel�s playground for a few hours. If you�re looking for a special and unique experience, look no further than Sabah Hotel. 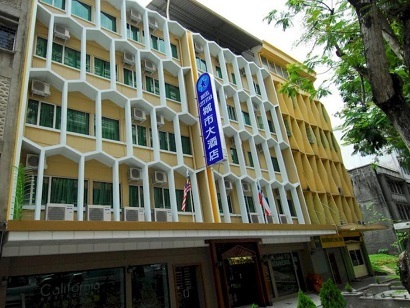 Offering quality accommodations in the culture, sightseeing, restaurants district of Sandakan, Hotel City Star is a popular pick for both business and leisure travelers. From here, guests can enjoy easy access to all that the lively city has to offer. 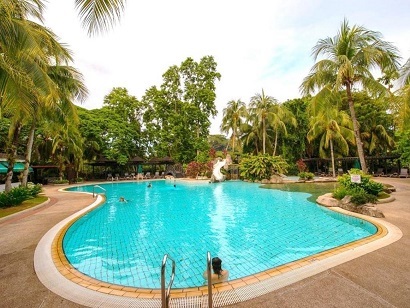 This modern hotel is in the vicinity of popular city attractions such as Basel Christian Church of Malaysia, Agnes Newton Keith Home, Japanese Cemetery. Hotel City Star offers impeccable service and all the essential amenities to invigorate travelers. For the comfort and convenience of guests, the hotel offers 24-hour room service, free Wi-Fi in all rooms, restaurant, tours, laundry service. Experience high quality room facilities during your stay here. Some rooms include internet access � wireless (complimentary), air conditioning, desk, mini bar, telephone, provided to help guests recharge after a long day. Besides, the hotel's host of recreational offerings ensures you have plenty to do during your stay. With an ideal location and facilities to match, Hotel City Star hits the spot in many ways.